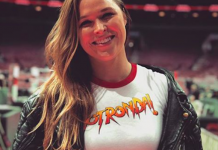 On Sunday night, during the WWE Elimination show, former UFC women’s bantamweight champion Ronda Rousey signed her WWE contract – and as expected, things got a pretty wild as she put pen to paper. See the highlights of Rousey’s first night as a member of the WWE roster in the Tweets below. And here’s how Stephanie McMahon reacted to Triple H’s trip through the table. While Rousey seemed to be holding back the tears throughout, which didn’t exactly inspire confidence in her ability on the mic, her WWE career is officially underway. She will partake in her first match at WrestleMania on April 8. Rousey’s WWE run will serve has her attempt to distance herself from two tough losses in the Octagon. The first was dealt by former UFC women’s bantamweight champion Holly Holm, who chopped her down with a second-round head-kick in 2015. The second came courtesy of reigning bantamweight champion Amanda Nunes, who mowed her down in less than a minute in December of 2016. Will you be watching Ronda Rousey’s WWE career unfold, or did your interest wane when she left the UFC? 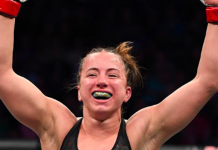 This article first appeared on BJPenn.com on 2/26/2018.